The Great Wall of China, the Taj Mahal, the Colosseum of Rome, and the alien-built Great Pyramids; history is full of architectural feats of great magnitude. Now is your chance to become that dude (or lady) who made a building out of dice. What gamer does not dream of living or working in a building made of dice? 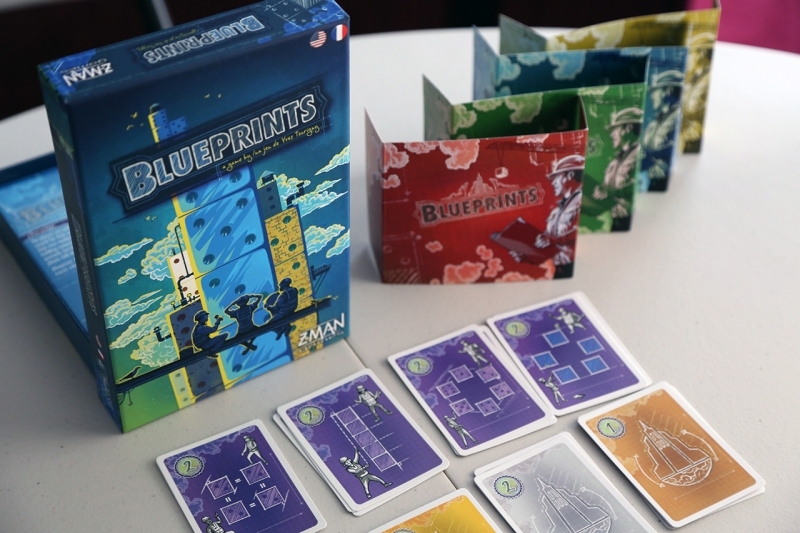 In Blueprints, you are competing against other worthy architects to help make those dreams a reality and construct award winning buildings from a pool of dice. Will you follow the construction project given to you or do you have the vision and intestinal fortitude to build outside the box (not literally though, that’s against the rules…stay on your card, people)? 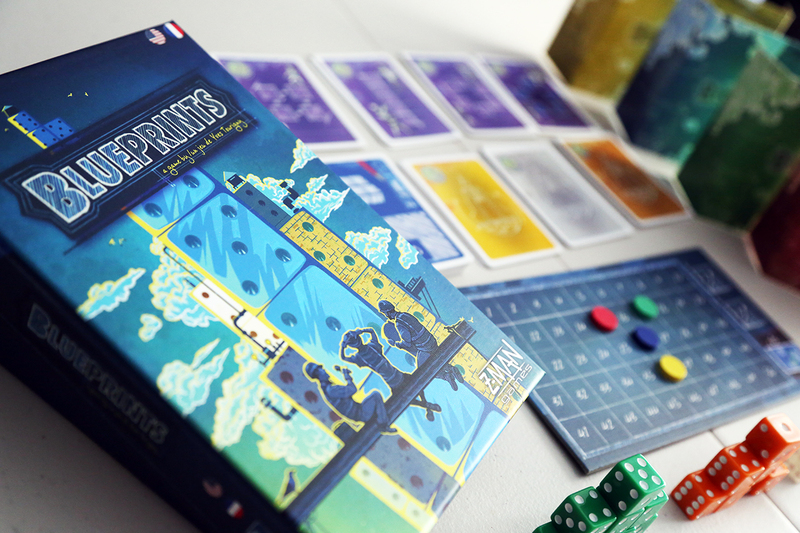 Blueprints, designed by Yves Tourigny (Expedition: Northwest Passage) and published by Z-Man Games, is an abstract game which pits 2-4 players against each other as architects competing to construct award winning projects. 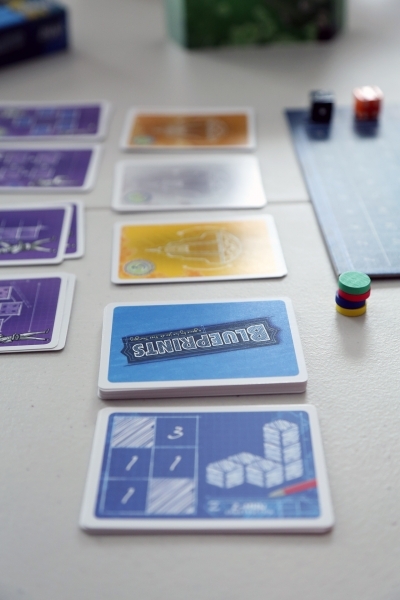 The game utilizes a drafting system for players to choose the building materials (dice) needed to construct their randomly assigned blueprint. Each die drafted awards points based on the building materials type (color), number on the die facing, and position in the design. When selecting dice from the ever-changing building supply pool, players will have to make the decision to complete their building as designed or creatively stray to wow the judges in other ways. The box is small and portable, perfect for squeezing on top of those meaty euros you bring to game night. For the number of components in this game though, the box can be tight if you don’t meticulously place each piece back in, especially the 32 dice. The dice are well constructed and allow for easy stacking. I have two very small complaints about the dice. One, the white pips on the clear dice can be hard to read in certain lighting. A simple trip to the optometrist may solve that for me. And two, the orange dice represent wood. Why not use the universal brown? Not a hindrance to the game whatsoever, just a personal gripe. The bag to hold the dice is ridiculously small to sufficiently hold the 32 dice provided in the game. I will say that after a few plays the bag does stretch and allow for a bit more shaking but I think you would be better off replacing it with something larger. The remaining components are made of your standard cardboard and/or cardstock and have held up well through numerous plays. Setup for Blueprints is a breeze. Each player selects a color, corresponding player screen, and disc. Place the score tracker, Awards, and 4 Prize stacks in the center of the table. Depending on the number of players the Awards available vary. There is always one less stack of Awards than the number of players. 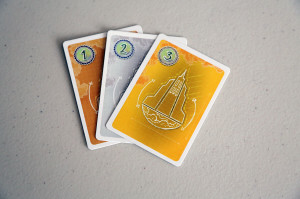 Thus, in a four player game 1st (Gold), 2nd (Silver) and 3rd (Bronze) will be available, 1st and 2nd in three player games and only 2nd place in a two player game. 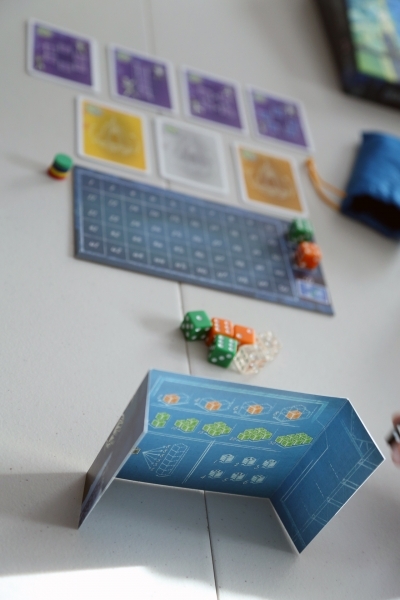 Place the 32 dice into the provided cloth bag, shake them up good (in the provided bag this may not be possible), and draw two dice to fill the in-demand materials boxes on the score track. These dice must be different material types and will be used as tie-breakers for the following round. 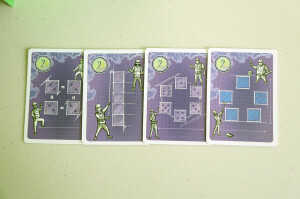 A random blueprint card is handed to each player to hide behind their player screen. This blueprint will act as your player board for the round and is used in constructing your building as described below. The starting player is the person who last visited an under-construction building. Unless you work in construction or you’re a serial killer, I would simply just roll one of the 32 (or all if you want) dice provided. 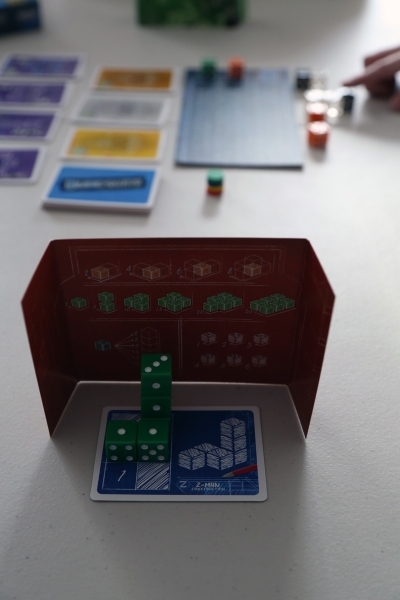 The starting player then rolls the selected dice to start, placing them in the in the building material supply and separates them by number. Now, you’re ready to begin! 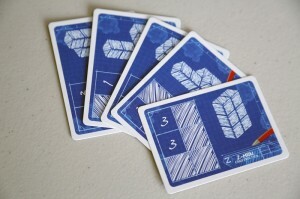 The game is divided into three rounds. Within each round there will be a building phase and a scoring phase. After three rounds, scores are tallied and a winner announced. 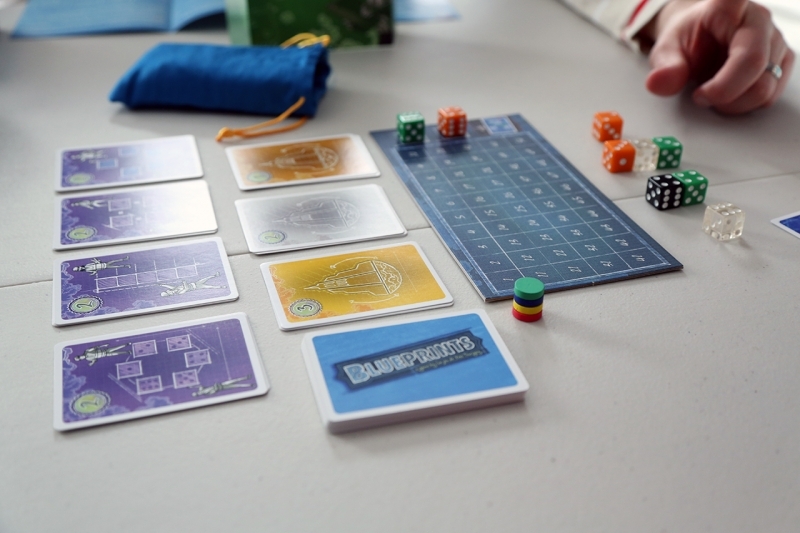 On a player’s turn they will simply choose a die from the available building materials in the pool and place it on their blueprint card. 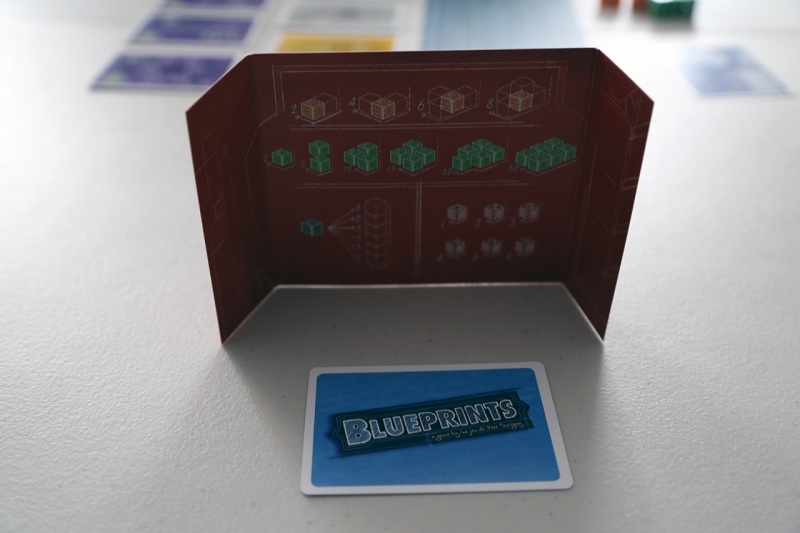 Blueprint cards provide both a top down view as well as an isometric view. Players will use the top-down view to assist in the assembly of their building. 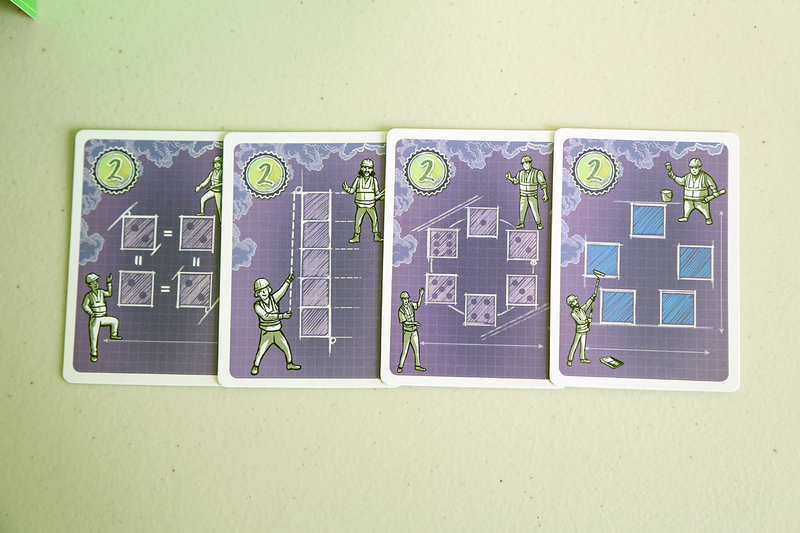 The numbers on the card correspond to the height of that particular section of the building on the blueprint. 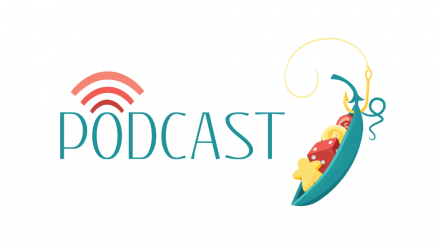 Players can place their dice according to these guidelines to obtain the Blueprint bonus or they can stray and build something more creative for the judges to rate. On top of an existing die of equal or lower value. After selecting a die, choose a new die from the bag, roll it, and add it to the building materials pool. 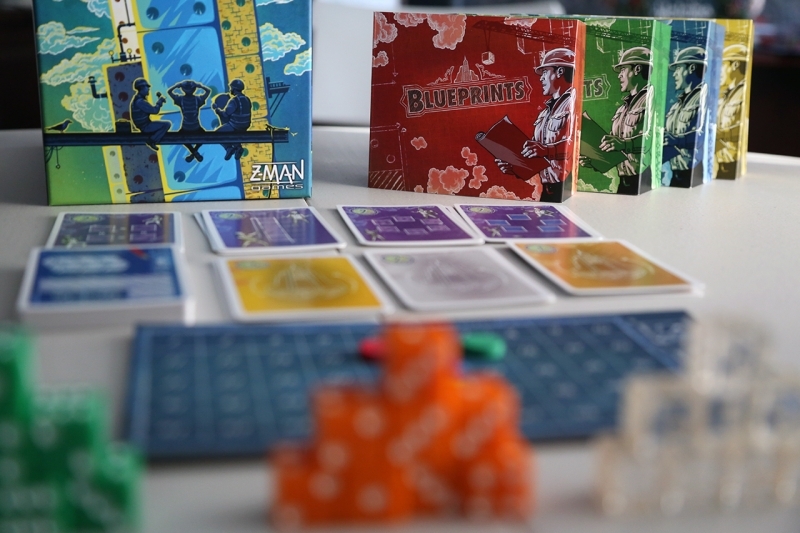 Continue play until each player has selected six dice for their blueprint. This triggers the scoring phase. 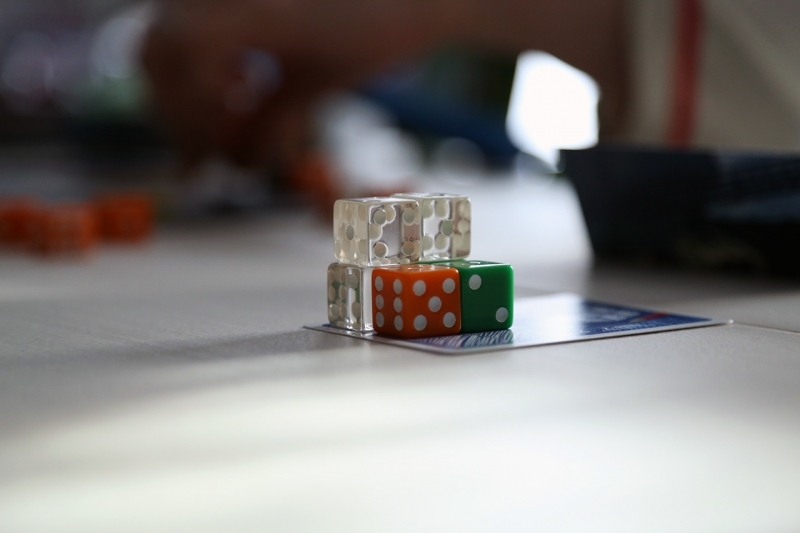 Note: Two player rules dictate that the game is played normally with one exception – after selecting the material die for your building, discard another die from the building materials pool and draw two dice to replenish the pool. This helps circulate the dice and keep the building material pool fresh with new materials. Players remove their screens to reveal the wonders they have created. 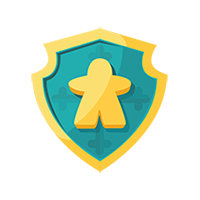 A Blueprint bonus of 6 points is immediately awarded to any player that constructed their building according to the random blueprint they were dealt at the start of the round. Wood (Orange…not brown…?) is scored individually and provides 2 points for every adjacent die. Dice are considered to be adjacent if they share a die face. Recycled Material (Green) score points depending on the number of green dice in the building. Players score 2/5/10/15/20/30 points for 1/2/3/4/5/6 recycled material dice used in your hippie haven. Stone (Black) is scored individually based on their height in your structure. Stone dice on the first floor score two points, 2nd floor scores three, 3rd floor scores five and 4th-6th floor scores eight points. Glass (Clear) is scored individually based on the number shown on its top face. For instance a die with 6 showing on its top face (regardless of whether it’s covered by another die) would score the player 6 points. 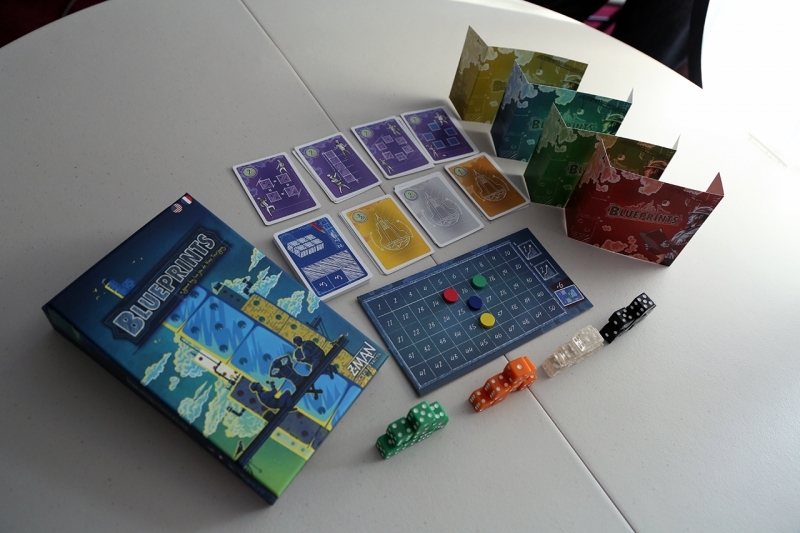 Materials Prize: Awarded to the player who used five or more dice of the same color in the construction of his building. 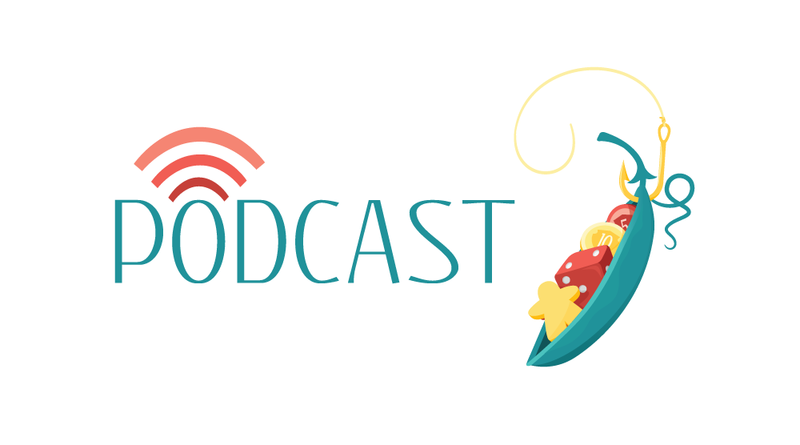 Only one prize of each type is handed out during the round, however, a player may earn more than one prize per round if his building meets the criteria (not easy!). For both Awards and Prizes, ties are broken using the first in-demand building material on the score track. The player that used the most dice of that building material to construct their building wins the Award/Prize. If the players are still tied, use the second in-demand building material. The final tie breaker is the player who acted last in turn order this round. If you can’t remember the turn order then Indian leg wrestle or roshambo. Once the Awards and Prizes are handed out, the round is over. 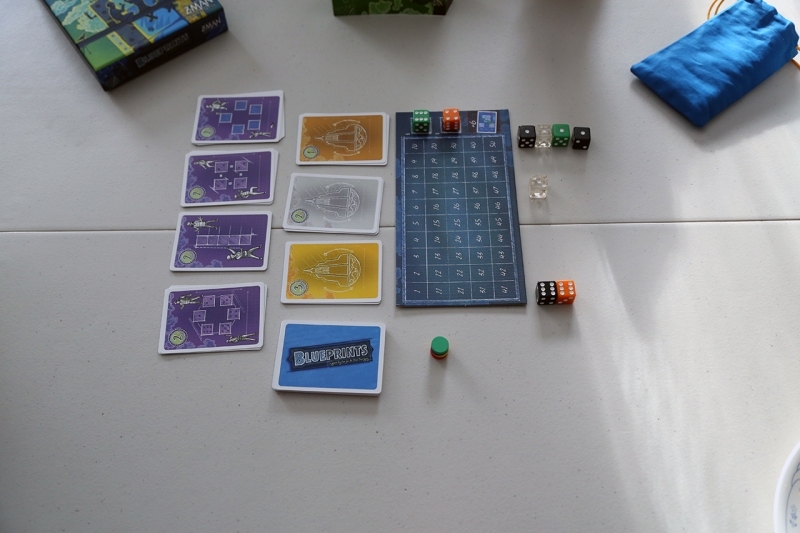 Return all dice to the bag, discard the used Blueprint cards, and reset the scoring markers to zero. 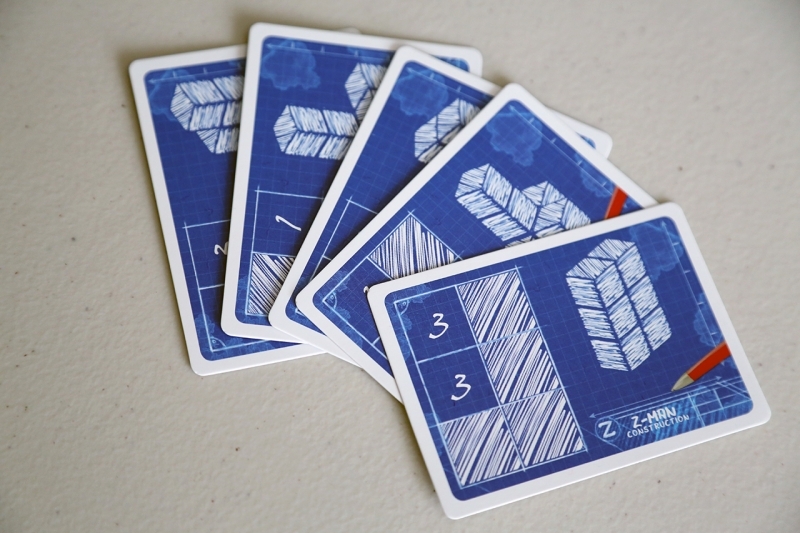 Next, distribute a new blueprint card to each player and start a new round with the player scoring the least during the last round going first. After three rounds reveal your points cards and the player with the highest amount of points is deemed the winner. There are another 4 tie breakers to follow in the event of a tie but I will let you refer to the rulebook for that. 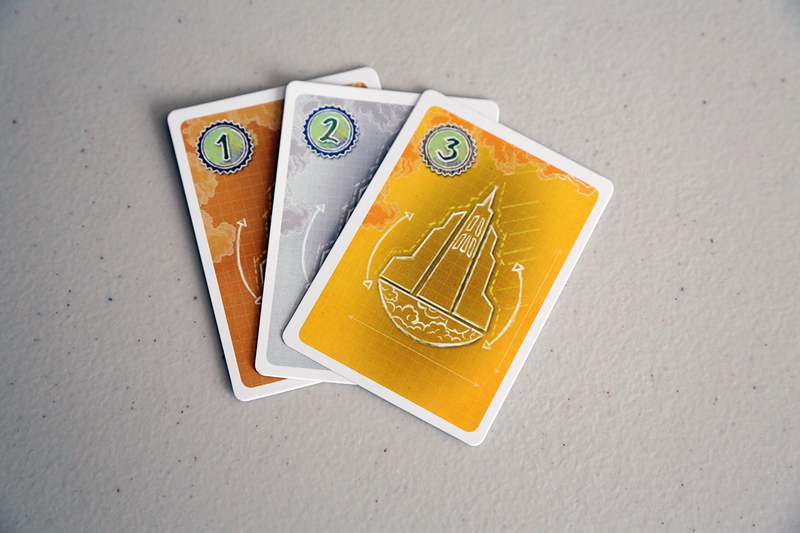 On the surface, Blueprints looks like a light filler game. And underneath the hood, well, it’s still a light filler but there are some strategic choices to be made on your quest to become one of history’s successful architects. 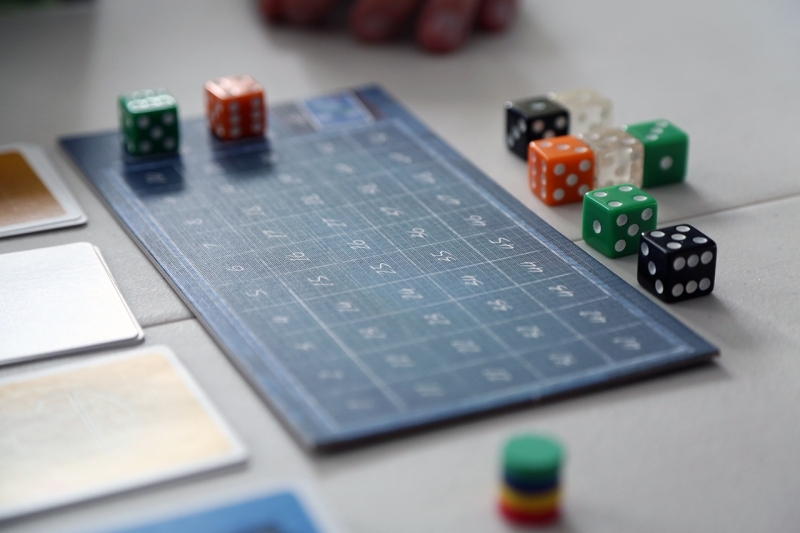 The game is easily taught in five minutes and plays out in around 30 minutes. Players have to balance the need to focus on their own building while still paying attention to what the others are drafting. That being said, player interaction is minimal and limited to denying others a potential building material that they need. Your ability to predict other player’s actions could mean the difference between which Award (if any) you are given because scores are typically close from round to round. Our typical rounds have all (or most) players in the 25-35 point range. The ever changing building materials pool and six die limit will force players to push their luck a bit when choosing the optimum play to maximize their end game points. 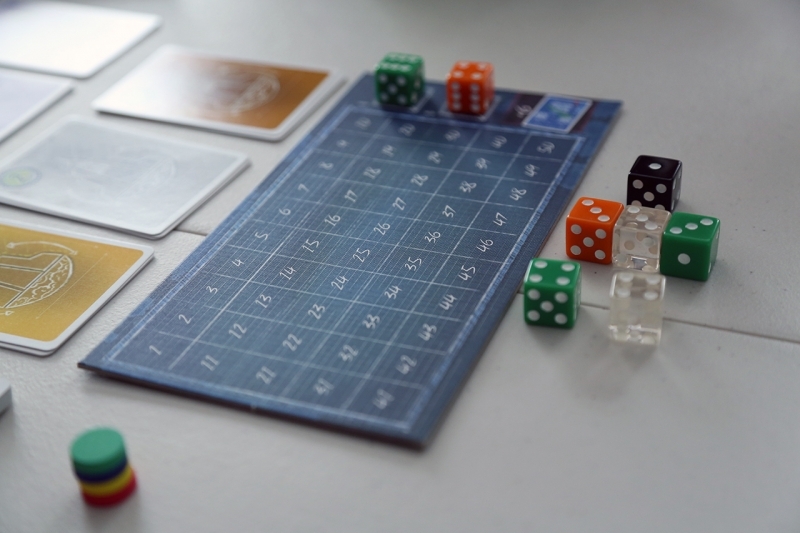 With your six dice, do you stay within the rigid guidelines of your blueprint or do you branch out and go for that Skyscraper Prize? Should I try my luck and hope that a 5th green die will be available on my next turn or do I just go with the safe five-point glass? The Prizes provide a further avenue of creativity for players to explore both within the confines of their blueprint as well as outside. Sometimes it makes more sense from an end game perspective to go specifically for the Prizes; especially if you feel the six point Blueprint Bonus will not affect your Awards score one way or the other. 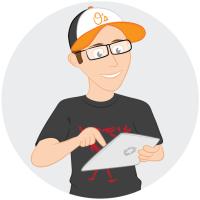 The true challenge is obtaining multiple Awards and Prizes in one round which could easily set you apart in the final scoring. Finally, I would stress that, in addition to paying attention to what your opponents are grabbing, be cognizant of the in-demand materials on the score track. There were a number of rounds where players went for the same Prize only to have their diabolical plan thwarted because they did not pay attention to the materials needed to break a tie. As a fan of building things (cities, civilizations, robot women), the concept of Blueprints immediately caught my eye. 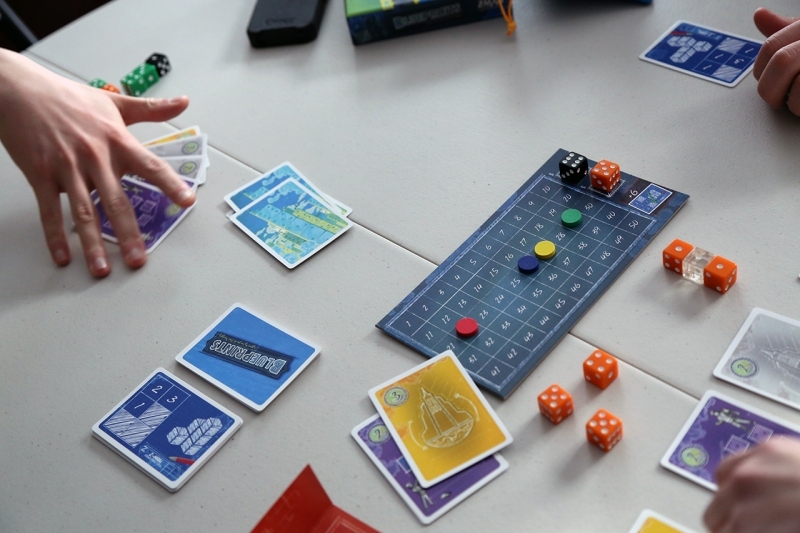 The game is easy to teach and plays quickly. One thing I am slightly confused on is the age rating given to this game. I disagree with the “14 and up” designation provided on the box. That’s not to say it’s an easy game but I feel it would be received and understood well by younger gamers (Disclaimer: This is simply my opinion – I have not played this with anyone younger than 19). 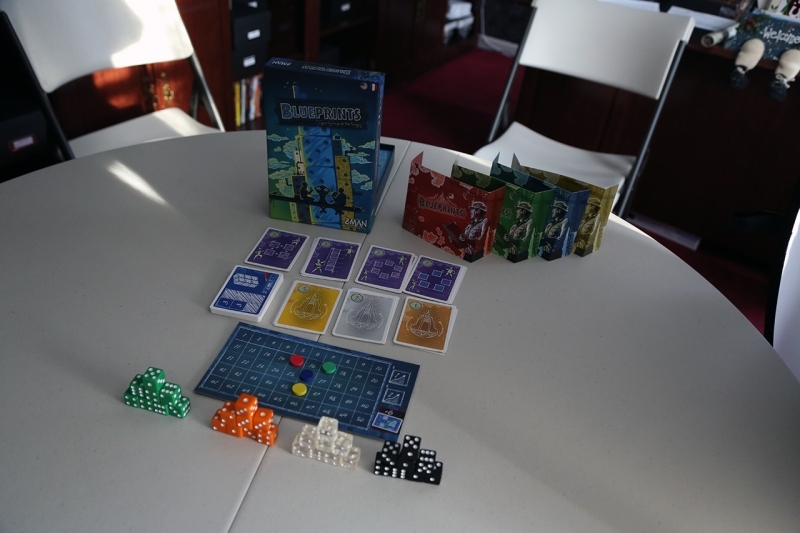 Outside of my few gripes mentioned above, the components are solid quality and have held up well over several plays. My biggest complaint is still the lack of player interaction because I prefer my fillers to have more of a social aspect to them. 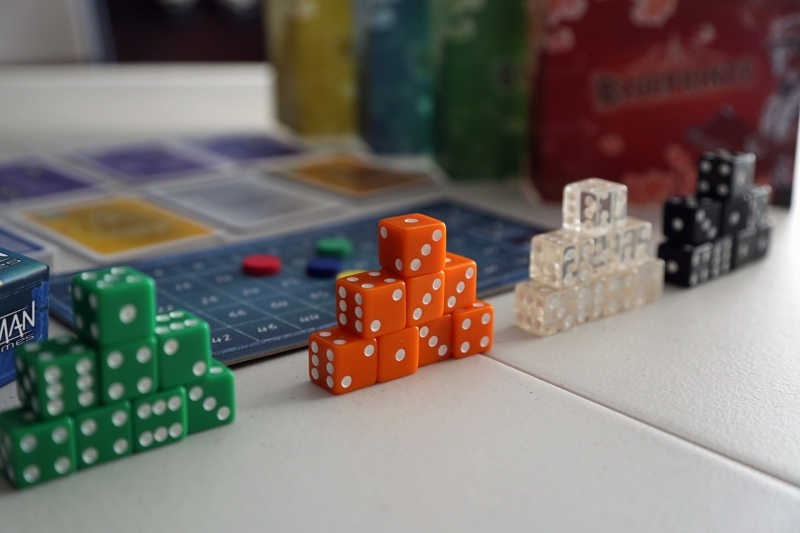 But with a quick playtime and enough strategic decisions to keep my neurons firing, I will happily go about constructing my little dice buildings anytime this game hits the table. 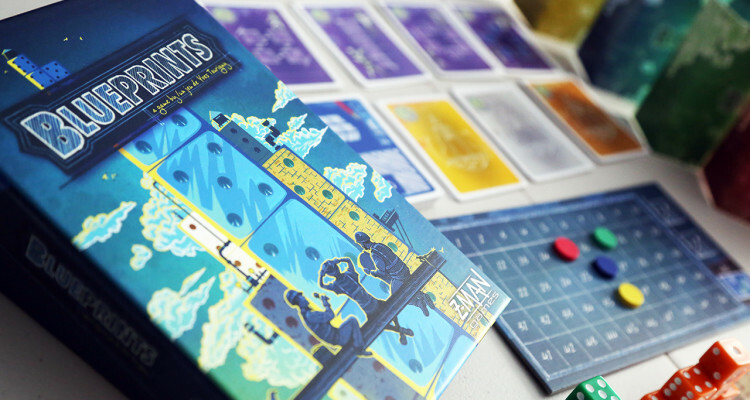 Blueprints is an easy game to learn, and plays quickly enough to toss into the little nooks and crannies between the bigger games that everyone else loves. This is not an indictment of it, however, as I’ve quite enjoyed building with my little dice blocks! One minor nit picky thing bothers me, however. And that is the fact that smaller dice are placed lower in the construction! 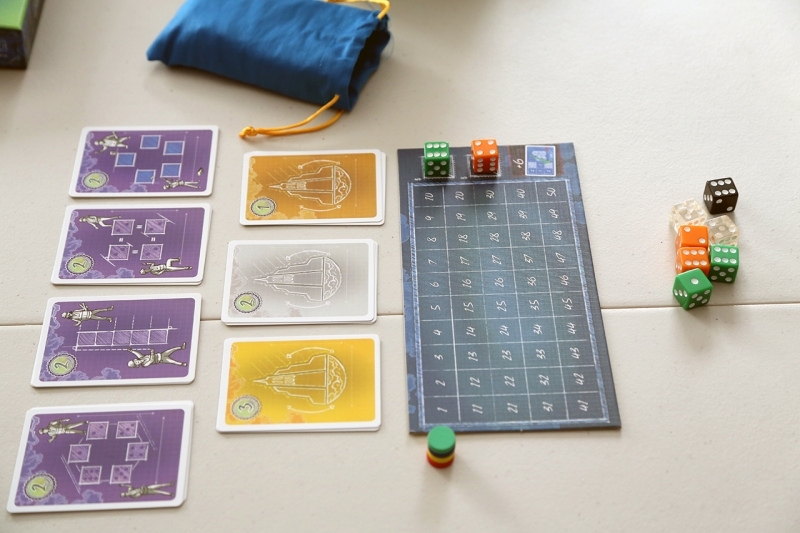 Logically, larger-valued dice should go lower, keeping your tower from becoming top-heavy and toppling over from a light breeze. Game-wise, however, it does make glass easy to score (Who wants to remember the inverse? ), and makes it difficult to take advantage of the high-point pieces. I’ll give the game an easy four stars, and two thumbs up in the filler-games category. Blueprints has easily become one of my current favorites. 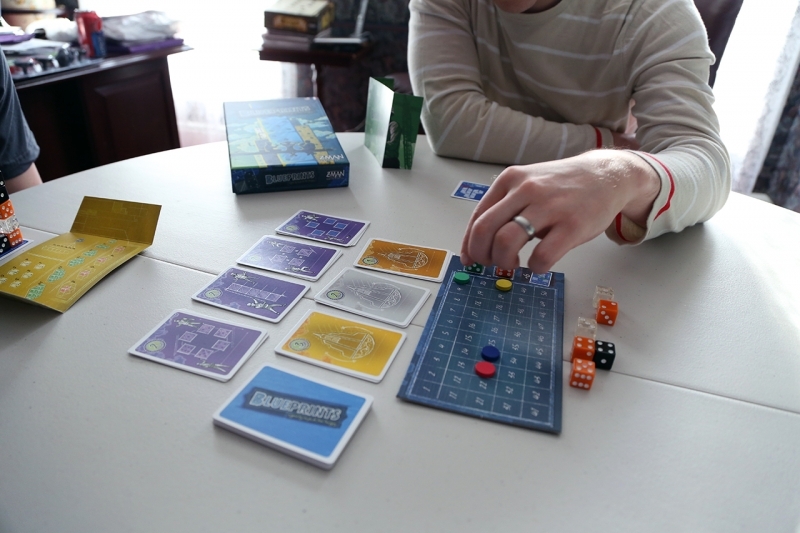 It provides enough strategy to be engaging, yet plays quickly enough to act as a filler game. It also scales well and plays great with any number of people. I found the 2-player rule of removing a die from the game on each player’s turn an interesting mechanism. 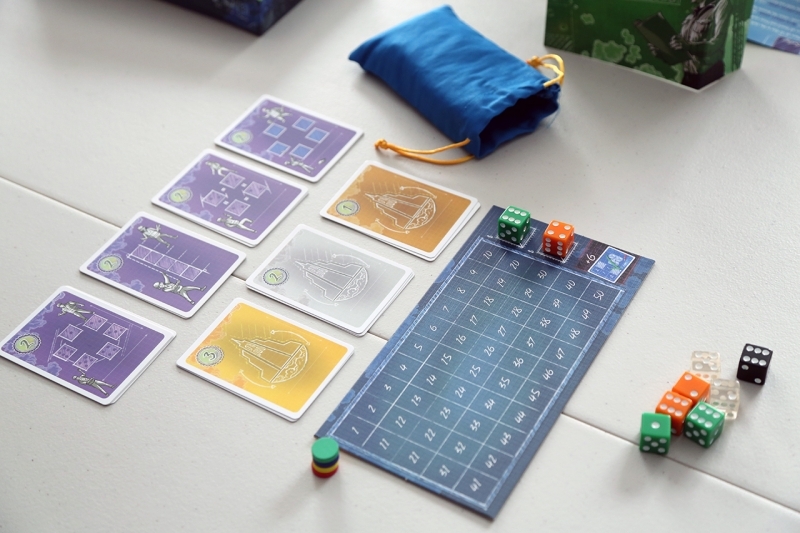 It works well and adds in an extra bit of strategy, giving you the opportunity to directly impact your opponent’s choices without having to worry about the die that you need to grab. As mentioned in the review, one of the only negatives about this game is that I wish they had given you a bigger dice bag. I don’t like not being able to shake up the dice well. I also have to agree with Smee on the logic behind placing higher value dice atop smaller ones. It actually bothers me to the point that I’m always tempted to petition for a house rule to reverse this anytime I play, but that’s probably just my OCD. After somehow managing to get past these destructive oversights, I find this game very enjoyable. Having this many League Rulings isn’t common with our reviews so far, but this anomaly speaks to the following that is forming around this unique little game. I’ve played this a number of times with the full range of player counts and can see a lot of positive aspects. 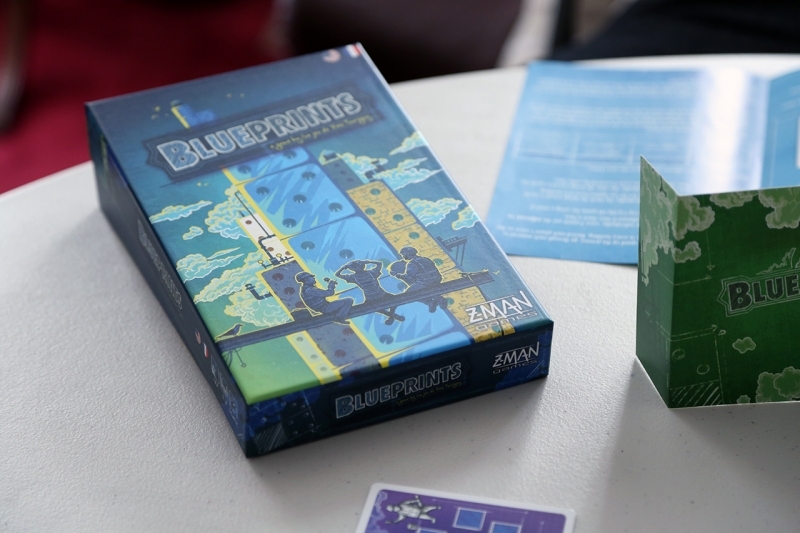 Blueprints is a quick and easy game to teach and play. 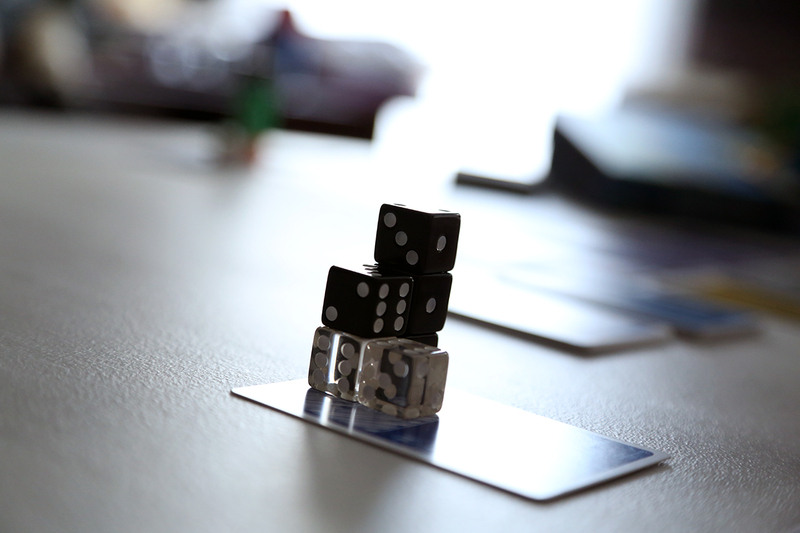 For our group, it fills the gaps between larger games or when the night is winding down. For another group, this could easily be more of a focal point, as there is enough going on here to engage a player and bring about the challenge – “Play again?” The combination of the dice-type scoring system, coupled with the random availability of those dice, makes maximizing your score an ever-changing puzzle. 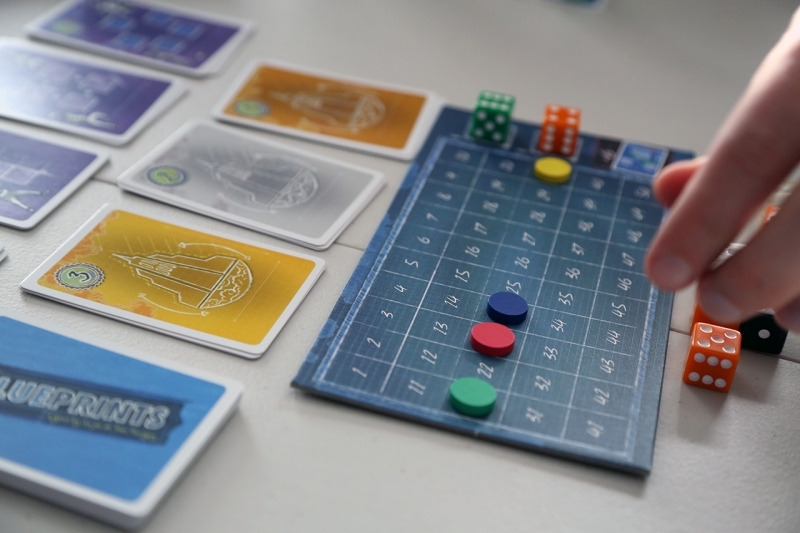 As Ben stated, the game scales well and the two-player version is particularly interesting because of the “take one, trash one” mechanic. With all its merit, however, I still struggle to show enthusiasm toward Blueprints. 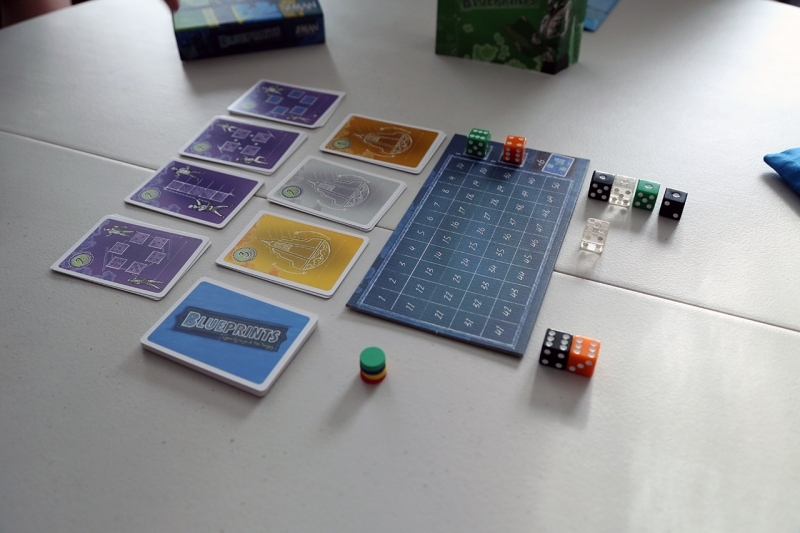 It’s a mechanically sound game (outside of the top-heavy dice debate), but the complete lack of player interaction in a 3-4 player game makes it more of a solo activity, as Biff said, than a tabletop game. It’s fun in the same way that comparing Tetris scores is fun (which is not a knock at comparing Tetris scores). Blueprints is good, I’m just not seeking it out on game night. Blueprints is building quite a reputation with our group. (See what I did there?) I’ve only played this once, so you’ll simply have my first, and only, impression of Blueprints to go by. The concept of the game is great and I found the dice stacking mechanic to be interesting. That said, it didn’t feel much like a game, but instead an activity due to very little player interaction. Perhaps the group I played with was a bit mild as two of us were playing for the first time but, even so, it was a fairly quiet game which is unusual for us. Every so often, someone would say something to the extent of “looks like someone’s building a glass tower” or “someone’s going green,” followed by a smirk and then crickets chirping. No one played maliciously. No one grabbed a die that someone was clearly going for. We all played so…friendly. In what world do we live in where all the architects get along swimmingly? Ultimately, everyone built something close to what their original plan was and, if they did stray, it was because that die wasn’t available at the time. With such a neat concept and my new found passion for fillers, I would like to give Blueprints another try. It wouldn’t be fair to rate it, so I will refrain from doing so until I can get a few more plays under my belt.